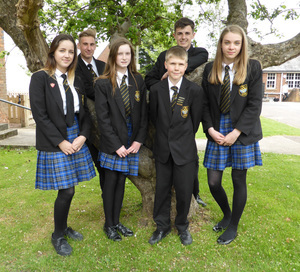 The expectation at the Axe Valley Academy is that all students comply with the uniform code. They will be expected to wear the uniform appropriately and that all items are in good order. Students should take pride in their appearance, and be smart throughout the school day, including the journey to and from school. Blazer: Black, with Axe Valley Academy badge in gold embroidery. 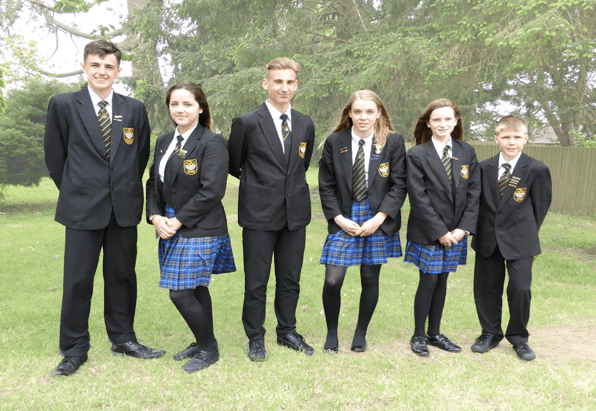 All students are required to wear the Academy blazer throughout the year. The blazer may be removed in lessons with permission from the teacher. Shirt/blouse: Plain white shirt that must be tucked in, with a formal collar. All top buttons must be fastened. All shirts must be tucked in. White polo shirts with the Academy shield can be worn during the second half of the summer term. Ties: AVA clip-on ties are compulsory for all students. Clip-on ties are available from reception. Trousers: If trousers are worn they must be plain and black (flares, tight fitting/straight leg and denim trousers are not permitted, this also includes trousers that have exposed zips and poppers). Skirts: If skirts are worn they must be the official Axe Valley Academy blue and gold skirt. The length must be no more than 2 inches above the knee (the skirts can be fitted by Thomas Moore). Jumper: Black jumper with the Academy shield can be worn underneath the blazer. The school blazer must be worn with the jumper. Shoes: Sensible, plain, flat, sturdy, leather and black-soled black footwear is essential. Trainers, boots and canvas shoes are not permitted. Socks: Socks must be plain and black. Tights: Tights must be plain, black and in good order (e.g. ripped tights will need replacing). Belts: Belts must be plain and black. Coats/Jackets: It is acceptable to wear a coat or jacket over blazers before and after school and during break and lunch. These must not be worn instead of blazers. Hooded jumpers are not permitted. Scarves/Hats: Scarves and hats can be worn before and after school and during break and lunch. Hairstyles: Hair colouring needs to be natural and discreet. Extremes of colour and styles are not permitted. Make-up: Make-up, if worn, should be discreet. Artificial nails (including gel nails) will not be permitted. Students are not permitted to wear nail varnish. Jewellery: One pair of small stud earrings/sleepers. Students are allowed to wear one ring. No other jewellery is acceptable e.g. bracelets and necklaces. Facial piercing:Facial piercing is not permitted. Students are advised that all types of bars/studs, including clear ones, are strictly not permitted. Internal ear piercings are also not permitted. Neither do we permit students to be in classes with piercings covered by plasters. Axe Valley Academy is a part of the Vector Learning Trust. Vector Learning Trust is a Company Limited by Guarantee registered in England and Wales number 07341523 and an Exempt Charity.